For: program listings, Code, List of corrections. 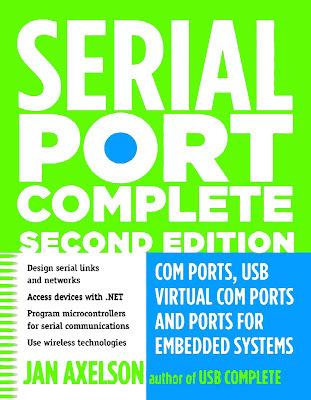 PC COM ports, USB virtual COM ports, and ports in embedded systems are all addressed in this updated guide to programming, interfacing, and using serial ports. Example circuits and code provide a quick start to projects. Installation and maintenance staff will also find tips for ensuring reliable operation and problem tracking. Los puertos de PC COM, puertos USB, virtuales COM y puertos en los sistemas embebidos están tratados en esta guía actualizada de la programación, la interfaz y el uso de los puertos serie. Circuitos de ejemplo y código proporcionan una salida rápida a los proyectos. Instalación y personal de mantenimiento también encontrarán consejos para asegurar un funcionamiento fiable y seguimiento de problemas. Managing Ports and Transfers in .NET. Options and Choices. When to use a Serial Port. Advantages. Limits. System Components. The Computers. The Physical Link. Programming. Applications. Example Systems. Managing Communications. Special-purpose Modules. Formats and Protocols. Sending Serial Data. Asynchronous and Synchronous Communications. Word Formats. Bit Rate and Baud Rate. System Support for Low-level Protocols. Sending Bits. The Format. The Need for Accurate Timing. Autodetecting the Bit Rate. Autodetecting a COM Port. Data Formats. Binary Data. Text Data. ASCII Hex. Application-specific Protocols. Preventing Missed Data. Flow Control. Buffers. Event-driven Programming and Polling. Acknowledgments. Error Checking. COM Ports on PCs. Port Architecture. Device Manager. Port Resources. Serial Servers. Accessing Ports. Drivers. Identifying Ports. GUIDs for COM Ports. COM Port Numbering. INF Files. Options for Application Programming. Inside RS-232. The Hardware Interface. Signals. Voltages. Timing Limits. Converting Voltages. Interface Chips. Short-range Circuits. Port-powered Circuits. Using Outputs as a Power Source. Regulating the Voltage. Alternate Interfaces. Direct Connection. Other Unbalanced Interfaces. Designing RS-232 Links. Connectors and Adapters. Connector Options. Adapters. Using Microcontroller Development Boards. Cables. Length Limits. Surge Protection. Isolated Lines. Ways to Achieve Isolation. About Grounds. Power Supply Grounds. Optoisolating. Debugging Tools. Using a Breakout Box. Monitoring with a Voltmeter. Oscilloscopes and Logic Analyzers. Inside RS-485. About RS-485. Balanced and Unbalanced Lines. Voltage Requirements. Current and Power. Speed. Internal Protection Circuits. Interfacing Options. Chips. Adding a Port on a PC. Converting 3.3/5V Logic. Converting RS-232. Controlling the Driver Enable. Re-enabling the Driver. Software-assisted Control. Hardware Control. Designing RS-485 Links and Networks. Long and Short Lines. When Is a Line Long?. Calculating Line Length. Choosing a Driver Chip. Line Terminations. Characteristic Impedance. Adding a Termination. Effects of Terminations. Reflections. Series Terminations. Terminations for Short Lines. AC Terminations. Network Topologies. Biasing the Line. Open-circuit Protection. Short-circuit Protection. Cable Types. How a Wire Picks Up Noise. Twisted-pair Cable. Selecting Cable. Grounds and Differential Lines. Ensuring a Common Ground. Isolated Lines. Using Multiple Buses. Adding a Repeater. Implementing a Star Topology. Going Wireless. Media and Modulation. Using a Carrier Frequency. Spread Spectrum Technology. Ensuring Reliable Transfers. Infrared. Transmitters and Receivers. IrDA. Radio Frequency. Complying with Regulations. Choosing an RF Band. Implementing a Link. Using Other RF Standards. Using .NET's SerialPort Class. Gaining Access to a Port. Finding Ports. Opening a Port. Timeouts. Receive Threshold. Closing a Port. Transferring Data. Transferring Bytes. Transferring Text. Using Stream Objects. BinaryReader and BinaryWriter. StreamReader and StreamWriter. Saving a Port and Parameters. The Application Settings Architecture. Combo Box Example. Managing Ports and Transfers in .NET. Receiving Data. Setting Timeouts. Detecting Received Data. Collecting Received Data. Ensuring Efficient Transfers. Sending Data. Avoiding Timeouts. Sending without Blocking the Application. Preventing Buffer Overflows. Ensuring Efficient Transfers. Flow Control. Selecting a Method. Monitoring and Controlling the Signals. Handling Errors. Exceptions. The ErrorReceived Event. Verifying Received Data. Structuring an Application. Defining a ComPorts Class. Setting Parameters with Combo Boxes. Defining Application-specific Events. Ports for Embedded Systems. A Microcontroller Serial Port. About the PIC18F4520. The Enhanced UART. Registers. Configuring and Accessing the Port. Setting the Bit Rate. Interrupts. Basic Operations. Accessing a Port. Configuring the Port. Sending Data. Receiving Data. Using Interrupts. Using Flow Control. Adding Ports. Multiple On-chip UARTs. Firmware UARTs. External UARTs. Network Programming. Managing Traffic. Steps in Exchanging a Message. Protocols. Using Existing Protocols. Debugging Tips. Addressing. Assigning Addresses. Detecting Addresses. Reserving Address Values. Defining a Message Format. 9-bit Format. An RS-485 Network. Connecting the Nodes. Transceivers. Terminating and Biasing. Cabling. Example Protocol. Addresses. Message Format. Commands. Reading a Byte. Writing a Byte. Polling the Nodes. Configuring the Driver-enable Line. Sending Commands. Responding to Polls. Auxiliary Routines. Decoding Received Data. Inside USB. Hosts and Devices. Assigning a Driver on the Host. Requirements. Host Responsibilities. Device Responsibilities. Speed. Endpoints. USB Transfers. Transfer Types. Transactions. The Data Toggle. Using Special-function USB Controllers. Inside the Chips. Serial Interface (FT232R). Parallel Interface (FT245R). Prototyping Modules. Using the Controllers. Drivers. Adding Vendor-specific Data. Implementing a Virtual COM Port. Converting from RS-232 to USB. Using Generic USB Controllers. The Communication Devices Class. Documentation. Overview. Device Controllers. Host Drivers. Using the Abstract Control Model. POTS Models. Virtual COM Ports. Requests. Notifications. Maximizing Performance. Descriptors and INF Files. Device Descriptor. Configuration Descriptor. Communication Class Interface Descriptors. Data Class Interface Descriptors. String Descriptors. The INF File. Composite Devices.